Ria takes the commitment to water savings seriously; first renovating her backyard two years ago, and last fall tackling her front yard. Birch trees and high-water turf were removed. 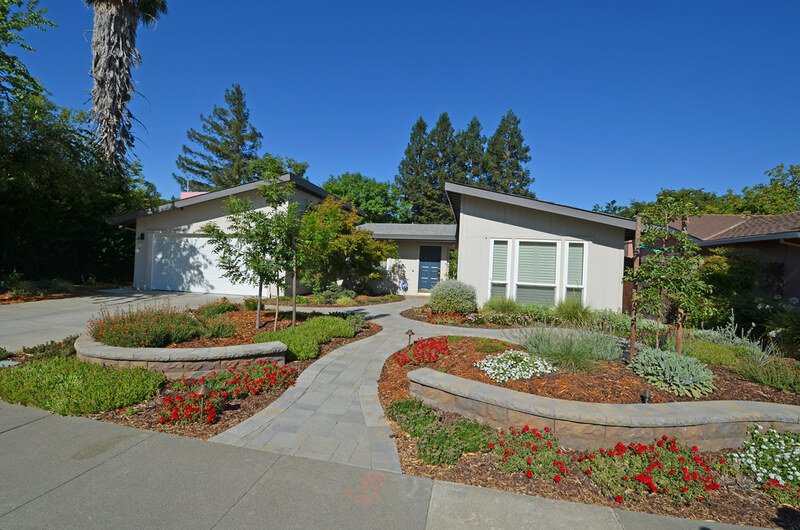 Now this east-facing front yard features subtly sloped areas behind two curved walls. This additional hardscape creates a structure for spreading mats of white lantana and red verbena whose long-lasting blooms add color and attract a variety of butterflies. That’s easy with two low-maintenance UC Davis Arboretum All Stars she’s planted: Cooper’s ice plant (Delosperma cooperi), a hardy succulent (see photo above) and dwarf oregano (Origanum vulgare ‘Betty Rollins’) with its ground-hugging dark-green leaves and pale-pink summer flowers. A shady area south of the driveway includes shade-loving and low-water evergreen currant (Ribes viburnifolium) with tiny maroon blooms in early spring and the winter deciduous dwarf plumbago (Ceratostigma plumbaginoides), which is popular for its deep-blue flowers in summer and red foliage when temperatures drop in fall. These contrast nicely with the spiky yellow and green sedges (Carex oshimensis ‘Evergold’) and Iris ‘Canyon Snow’ planted nearby.